This year's Drummathon is not only FREE to attend but is also FREE to register, and you don't have to be a drummer to join in on the fun - anyone can register and fundraise! 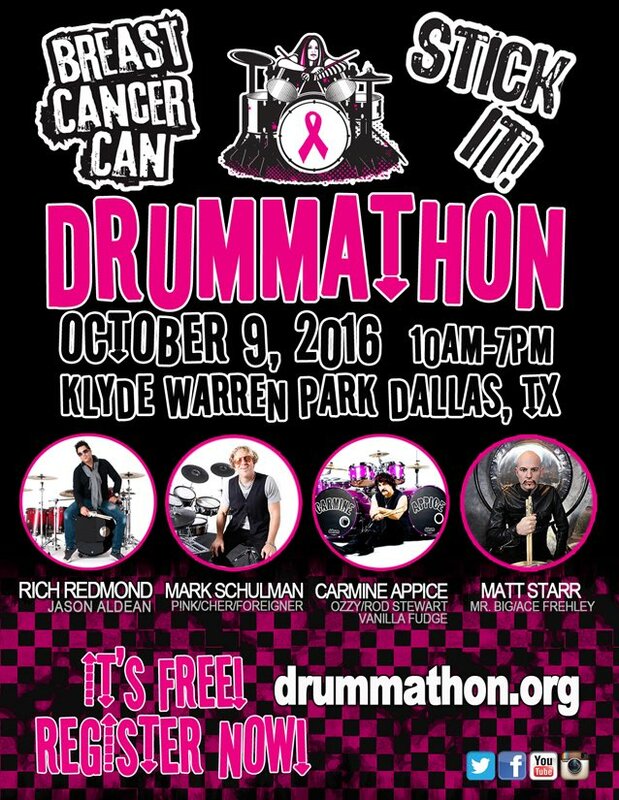 The top 40 fundraisers ($250 minimum) by October 2, 2016 at 7pm CT will 1) win the opportunity to play a three minute solo the day of the event, 2) receive a goodie bag, and a 3) Drummathon 2016 t-shirt. The top three fundraisers will win additional prizes! For every $20 raised, registrants attending the event will get a raffle ticket in their goodie bag. At the event on October 9, registrants will have the opportunity to tear off their raffle tickets and deposit into the bucket for the raffles of their choice, on display at the event. The day of the event will feature live music interspersed with drum solos as well as solos by some of the top celebrity rock star drummers - with a chance to drum along side one of the rock stars. Simultaneously, attendees to this free family-friendly event can visit food trucks, vendor booths, and autograph booths as well as browse and sign up for silent auctions and raffles. While at the show, MC's will even throw out an array of giveaways.